Day three of the Austria Cup, the inaugural event of the new Bullitt GC32 Racing Tour on Lake Traunsee in the Austrian Alps, started strong for the Omani boat with Leigh McMillan and the team starting where they left off yesterday, winning the first race with an emphatic 650m lead over second boat Spindrift. But as the breeze started to disintegrate, so the racing became more random and according to Sultanate of Oman’s Pete Greenhalgh, a tactical decision which did not go their way when the wind died in the second race saw them drop dramatically from first place to fifth before recovering to finish in fourth. “It was a really wacky day and we had to piece it all together,” he said. “The first race was clean and steady but in the second, we were leading until half way up the last beat when we tacked to protect our position at which point it went super light and everyone sailed round us. 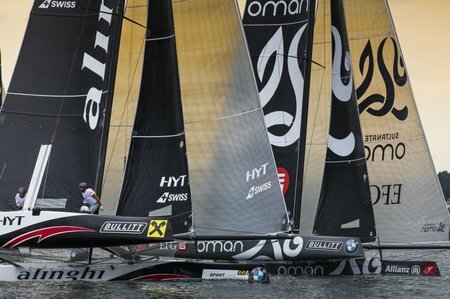 The second race turned out to be the final race to yield a result since two others were started but had to be cancelled when the wind died but by then Sultanate of Oman, supported by the Ministry of Tourism of Oman and EFG Bank Monaco, had extended its lead at the top to nine points over second placed Spindrift tied on points with Alinghi with one day’s racing remaining. It was another strong performance by the Omani team who came together for just four days before the start of the 2015 Bullitt GC32 Racing Tour but a quick grasp of foiling, aided by their two America’s Cup experts Glenn Ashby and Alister Richardson has hugely helped their progress. “This is a new concept for us coming from the Extreme 40s,” said Greenhalgh referring to himself, Leigh McMillan and Nasser Al Mashari who are regular crew on Oman Sail’s Extreme 40 The Wave, Muscat. “Boat-handling and trimming wise, it’s a whole new ball game. We might not be up on the foils but we are still towing them round on the water and they require a lot of trimming so for them to be efficient, we have to get our timing and manoeuvres spot on. Ashby agreed that the learning curve was steep for Sultanate of Oman’s crew but shared knowledge was key and they had no complaints over the day’s results. “A 1-4 for the day is not a bad day and we are still in pretty good shape,” said Ashby who will be returning to his America’s Cup team Emirates Team New Zealand at the end of the Austria Cup on Sunday. “Obviously this is a huge learning curve for everyone but having the fundamental knowledge of what needs to happen is useful because then you try to get all five guys on the same page working well together.